My laboratory is using zebrafish to discover genes that are indispensable for the growth of rapidly proliferating tissues during development. Typically these genes are inactive during adulthood but are often commandeered by cancer cells later in life. We have now identified several genes that may contribute to cancer development. We are currently testing whether they could be worthwhile targets for novel anti-cancer therapies. To do this we are disrupting the activity of these genes in models of lung, liver, stomach and bowel cancer. Collectively these cancers cause nearly half of all cancer deaths globally, and new therapies are urgently needed. My laboratory's research is driven by the recognition that many of the dynamic processes occurring during development are also highly active or dysregulated in cancer. We use developing zebrafish to investigate processes including cell proliferation, differentiation, migration, angiogenesis and apoptosis. These cell behaviours can be easily followed and analysed in zebrafish embryos due to their external fertilisation, optical transparency and genetic tractability. Using a mutagenesis screen, we have discovered several genes that are critical for the growth and development of the rapidly proliferating zebrafish intestinal epithelium. We are now investigating whether the aberrant expression of these genes plays a role in the development of lung, liver, stomach and colon cancer. We hope these studies will enable us to propose new targets for cancer therapy. Why are zebrafish increasingly used in medical research? Joan Heath writes in The Conversation. 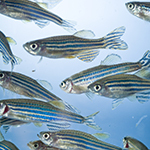 Joan Heath writes about using zebrafish in cancer research, in The Scientist.